I'm impressed to see such a big unit, painted to such a high standard.. on such a short time! Well done! 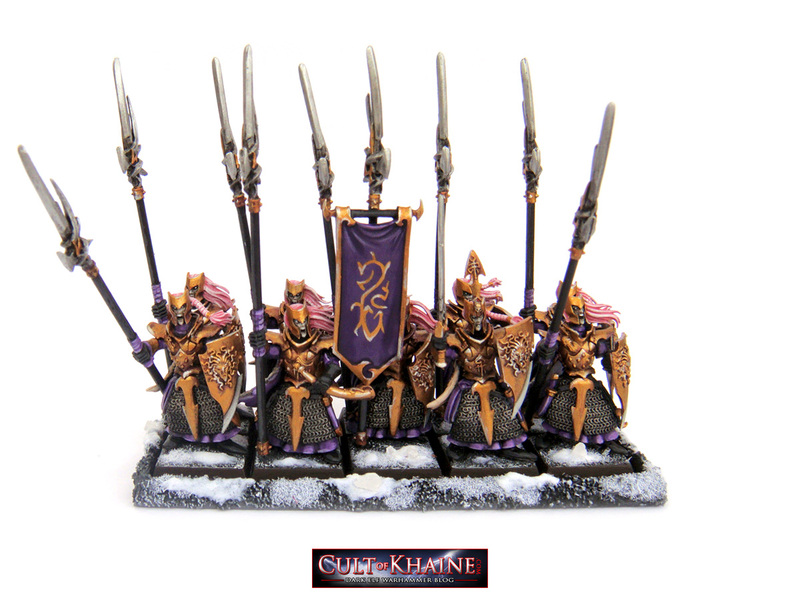 Thanks Daeron - I surprised myself last month at how quickly I painted them. Hopefully I can keep the momentum going for this month. 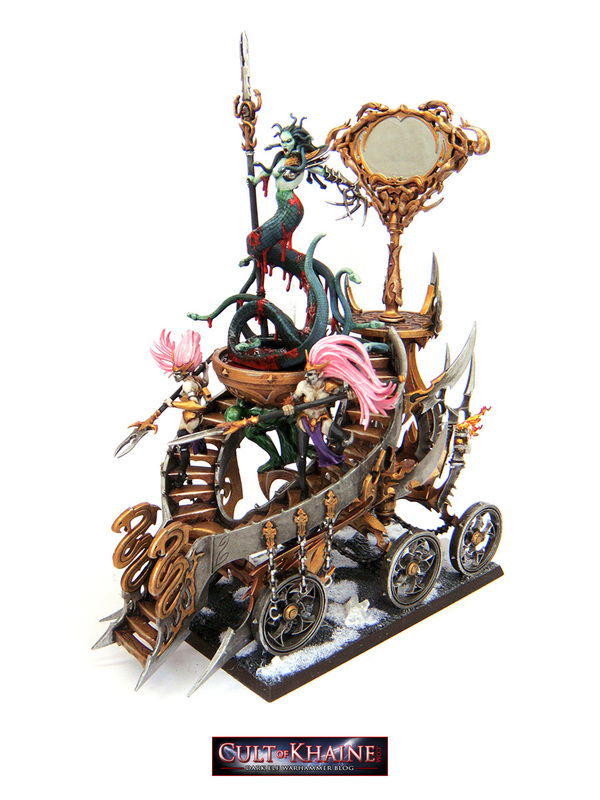 Pledging my Harganeth chariot and my Medusa on throne! Maybe I'll also try to finish 20 Darkshards, but it really is a long shot. @Sabious - Excellent work, the leather on the baloon looks very realistic and (as always) your base is masterfully done. @cultofkhaine - Wow, so many of them... Words of compliment for the effort. My Feb Pledge is complete - Something Big! A couple more pics on my plog and blog page. How is everyone else going for this month? It would be great to see some more work painted. I think I might get a head start for next month while I am ahead and pledge a unit of 10 Black Guard. But I did hook up my airbrush to my garage's compressor, so I will be experimenting with speed-basecoating with it soon. Especially for my Black Legion, I hope it speeds up putting on a black basecoat on the entire model. For the Witch Elves I might be making later this year, I'll experiment with a more fleshy basecoat. Great work again Cult! Impressive the production you got going there. Churning through it this month!!! I present Morathi's personal Gorgan Guard. More pics on my plog page. Wow, those look really great! I'm amazed at your speed and your skill. In other news, I have finally managed to finish the last crew model for the cauldron I'm working on. This means that the only thing missing is building and painting the base and then placing the three elves and the Avatar. I'm not sure I'll manage in just two days, but... I might. Hehe, here's a quick preview of the two first models I tested on. I'm working on a unit of 20, all different looking. 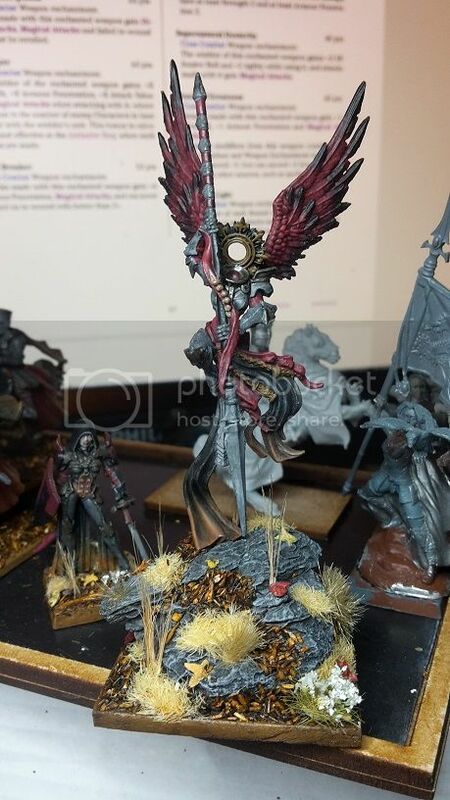 They look cool - old school - where are the models from? These two are from Mirliton. I was browsing their site for helmets since they sell bits too, and thought these might be cool additions. The rest of these first twenty I am painting are a mix of Agincourt knights from Perry Miniatures and Fireforge Templar Infantry. Later I will add Raging Heroes. This is a new army for me. I had such an urge to paint knights I just dived right in. 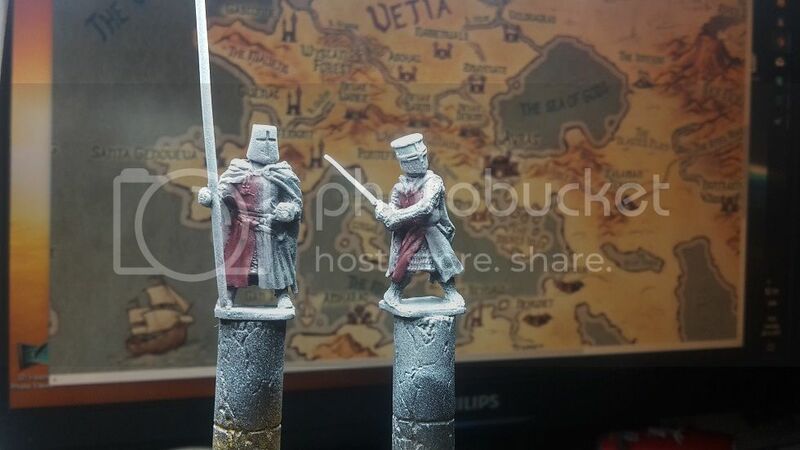 Here are my first 20 foot knights (looking to up that to 40 sometime). I was in a mood for a darker theme, especially trying colours my other armies don't have too much off. One thing I always shied away from was black, so I had to make that the main one! I decided to pair it with a burgundy red to give it a strong colour, yet not your typical red&black guys. I also decided to try painting without metal colours. Not that I lose any sleep over trying to make fancy light effects on the armour. I just wanted these guys dark and gritty. Like a disgraced order. The Black Knight's secret army? Who knows. Models are Perry, Fireforge and Mirliton bits. The hero on the side is one of the Raging Heroes freebies (Celenia) whom I gave a shield instead of her original crossbow. So far she will be a character, until I one fateful day reduce her to a regular, should some other model usurp her. Also, I tried around with the heraldry and really liked the Black Tower against a Burgundy Sky, however it (so far) leaves me lacking any symbols adorning tabards and capes. I think I would need a third colour for this. Advice is gladly accepted! On the shields you will see I have toyed around as well. Tower, chains, stripes.. I can always redo the shields when I know what I want. Lastly, the banner was also a new experiment. Made it from linen cloth and now is completely stiff as plastic, due to the dried white glue I used. I like the banner and your basing is excellent. 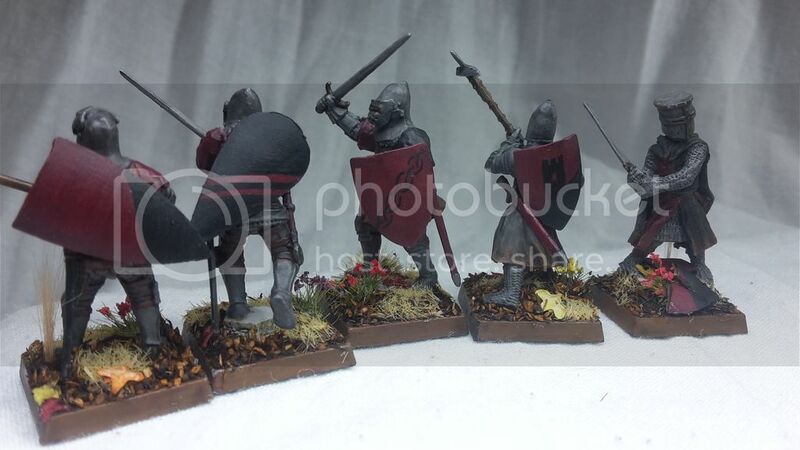 With regards to the black on the shield designs - you should try a few dark grey highlights and perhaps a little dot of pure white to give them a bit more punch. Wow, the knights look awesome. I think my favourite part is how well everything fits together - the theme and colour scheme, the heraldry, the basing... Celenia with her hood also really helps. The banner is great. I've tried using paper and super glue in the past, but this seems like a much better way. Great job! And my Divine Altar is finally finished. After more than two months, but... juggling two jobs is not easy. What did you use for the fire - it looks great? Wow two months worth waiting Rowena, very nice and impressive centerpiece! 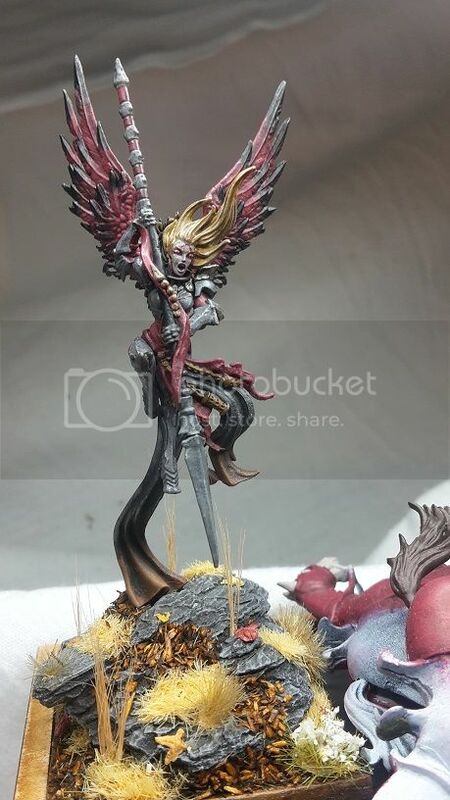 I really like the fire sorceress but that banner is also stunning. Sabious great work as always! Your bases are incredible, although in this case maybe too incredible as it steals the eye and therefore leave the dark knights a bit less interesting. As cult already said I think some highlights around the metal can already greatly make them stand out a bit more in contrast to the superb bases. The same affect has also been used between the phoenix and the sorceress to smoothen the transition between them. The phoenix itself is Phoenix Force from Heroclix. and the bowl is Phoenix Guard banner top cast with crystallic resin. Wauw, very original altar! Refreshing. I wouldn't be miserable about that Interesting models and very nice marble effect you got going, Rowena! And thank you for the very kind words on the knights! The banner and watered down white glue did the trick for me, although it does 'feel' messy, and as if it won't work while still wet. I'll admit I did go in with some superglue to fasten some of the bends, and a couple of places the two sides of the banner opened up. Try it! - and wauw that sounds advanced to my ears about the way you did the altar! The highlights you guys mention are indeed on my mind. The black is a tad black-black, two dimensional and a few knights benefit from better armour highlights, but I found it a tricky thing. Glad to hear you spot the same things I was concerned about. I like finding the next steps to work on, despite them being table-ready. 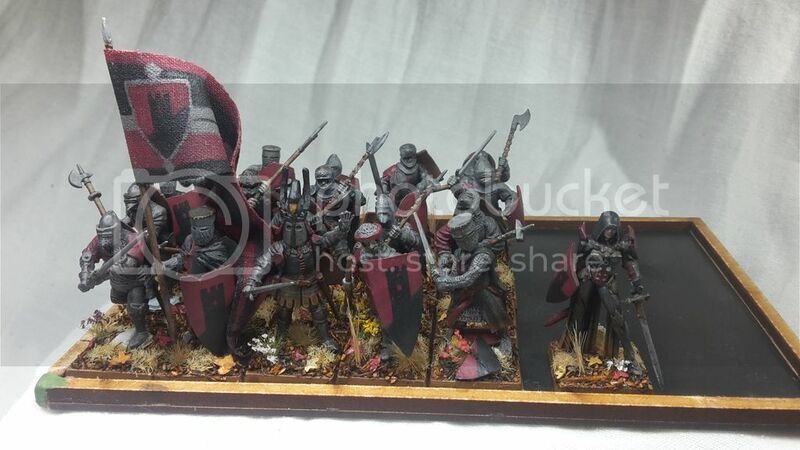 Then who cares if it might actually first happen months from now Heh, and I get your point about the basing outshining the knights (could be pictures darkening slightly), but it makes me smile. While I develop those next stages I am still on the lookout for a cool knightly symbol to add to shields, capes and tabards where I see fit. Something with a beige/white/yellow colour would also help I think. So if you know just what they need, let me know! Thanks again for the all the feedback, really helps! So how is march coming along? After a productive month last month - this month has been a slow start. 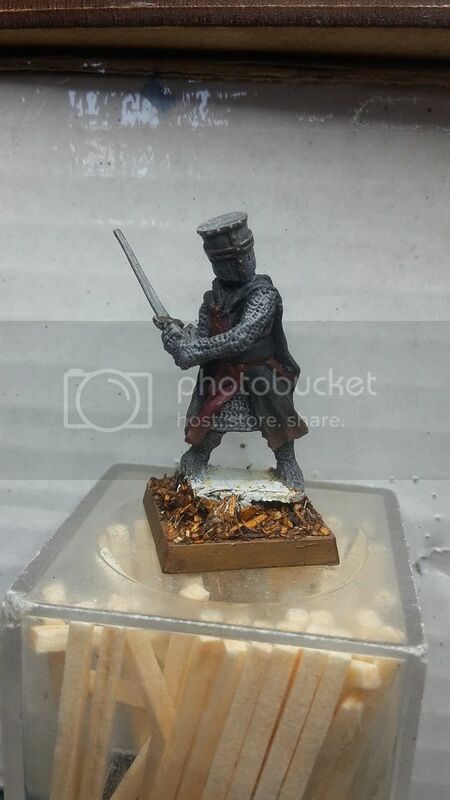 We have a comp here at my local store called Best in the West - I might paint up a hero for that. I am progressing nicely on my 20 Corsairs, now nearly finished with their cloaks. Only 7 days left for the rest however!